Gorgeous in Geraldton, Geraldton Floral Studio is painting a masterpiece, and offers efficient, same-day delivery to a variety of significant destinations, including cemeteries, nursing homes, hospitals, retirement villages, funeral homes, and churches and places of religious worship. We deliver to a wide range of hospitals and medical centres in Geraldton and surrounding suburbs, such as Geraldton Hospital, St John of God Geraldton Hospital, Victoria District Medical Centre, Psychology West, and Geraldton Regional Hospital. Included among the retirement villages and nursing homes that we service are Juniper Hillcrest Assisted Living Facility, Opal Geraldton Aged Care Service, Nazareth House Geraldton Aged Care Service, Bethanie Geraldton, and RSL Care WA Retirement Community. Further, we provide delivery to an array of local churches and places of worship, notably Sun City Christian Centre, Lighthouse Church Geraldton, Geraldton Baptist Church, Geraldton Anglican Church, and Geraldton Seventh-day Adventist Church. We also offer delivery to many funeral homes and cemeteries, among which are Geraldton Cemetery Board, White Lady Funerals Geraldton, Mid West Funerals, Geraldton Funeral Services @ Evereve Funeral Home, and Bethany Funeral Home. 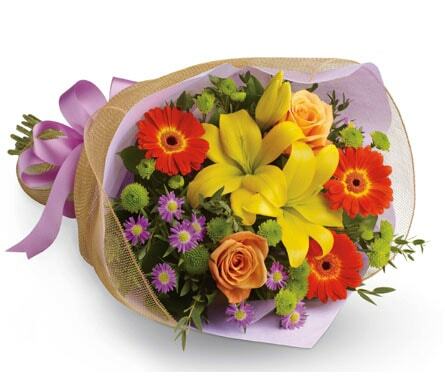 Geraldton Floral Studio will have you feeling peachy, thanks to our graceful bouquets and angelic floral arrangements, which will add a dazzling dash of life to your next special event or celebration. In particular, our loving �Romance� packages will set the mood for a special night for two. The best things in life are free, like fun and flowers, sun and smiles, joy and friendship, and �Love and Laughter�. 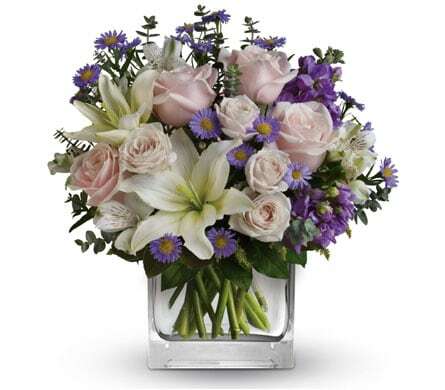 Fill their heart with love and their lungs with laughter, courtesy of this delightful blend of pretty pink roses, glamorous pink lilies, and stunning yellow alstroemeria, which are displayed among stylish, bushy greens, and housed in a striking blue bouquet. Everyone loves to laugh, so send �Love and Laughter� today! �Polka Dots� are always in fashion, so give that lucky someone a dotty treat. 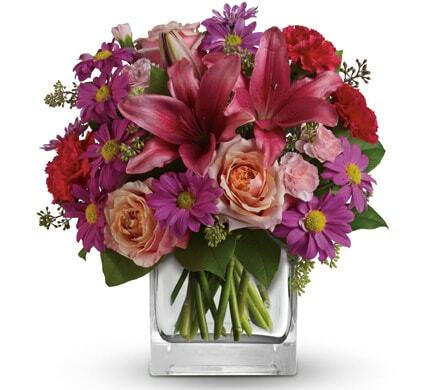 Cherish the delight in their eyes as they receive this tremendous blend of pretty white posies, soft pink lilies, and graceful red blooms, which are accented by gorgeous greens, and housed in a charming, polka-dotted flower box. �Polka Dot� your way to the top! A glorious costal town in Western Australia, Geraldton will wow you. Inhabited by slightly less than 40,000 people, Geraldton was originally home to the Indigenous Yamatji people. Geraldton is a highly popular tourist destination, with attractions like the Geraldton Sunshine Festival, which was established in 1958, making it one of Australia�s longest running festivals.